In their final years, Monet painted Water Lilies, van Gogh discovered Sun Flower, and Matisse invented Paper Cutouts. In all cases, it was thought at the time that there was something rather childish about these later works. Picasso's drive for the extreme was equally strong as Monet's or Matisse's. In his last four years, he created more than at any other comparable period of his life. His life instinct became the urge to paint. The crude incompleteness of his shapes made use of an almost infantile pallet: pink and pale blue mixed with milky shades between beige and ochre, and then again, pure colors straight from the bucket, applied with a wide brush. It is remarkable to what extent Picasso abandoned his sense of color, mocked the culture of his pallet, and demanded the coarsest articulation and position of his figures. Deformed members of the body amorphous forms, noses squashed flat and caricatured, buffoonish eyes and hands mark the animalism of his vigorous half-wits. Primitive but matchless, these paintings are superior to their expressive descendants of today. Resembling members of a burlesque troupe, they demand everyone's attention. What painter has not profited from this one, who contributed to every form of expression in our century? Jackson Pollock, Willem de Kooning - in comparison to these archaic creations, their's undoubtedly look brilliant, but also almost complacent. And aesthetic appreciation has embraced them, and long ago given each its unique place in art history. Picasso, who created so much, at the end reclaimed what was his due. He reaped so much from his children, that he occasionally seems to devour them orgiastically. It is not Goya's terrifying painting that comes to mind, but rather that of a Gargantua, who insatiably consumes life in order to get the materials necessary to house his creatures. However, he did not draw only on those impulses he himself had created. In his old age, he allowed himself a freedom that, at the very end of his life, he did not try to justify. He saw next to himself the ghostly companion, whom he acknowledged as The Young Painter on April 14, 1972, with the round face and the soft outlines of a doll. Button eyes and an exotic hat with a wide brim, the demonstratively raised hand with the thin brush do not conceal that this portrait shows the ancient painter with childlike features. The tenderness and uncertainty of the facial expression give the portrait a quality of ghostly isolation, which claims as its parallel the later works of Francisco Goya. 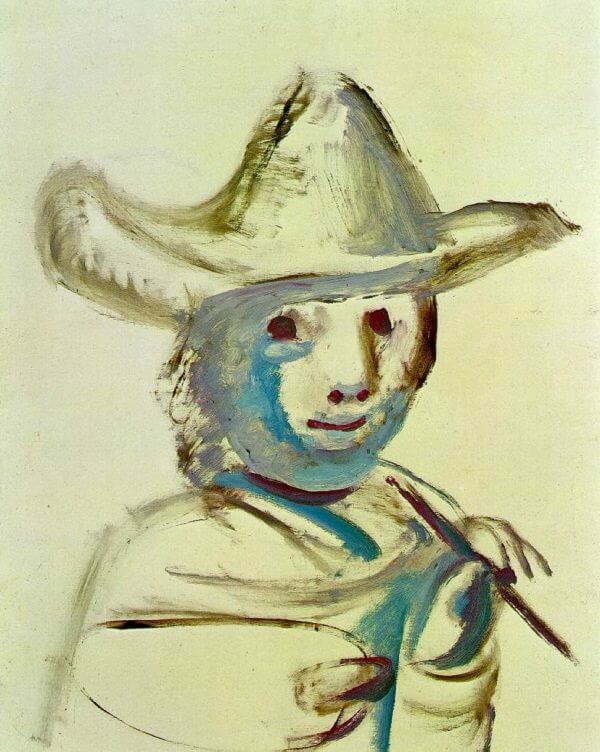 In a pitiless confrontation with the mirror, on June 30, 1972, Picasso once more looked himself in the face. In that mirrored image he saw, with wide eyes, death. For this drawing he used chalks in the same blue, mauve, and black he had employed thirty years earlier in a still life with cow's skull, created after he had been stunned by the news of the death of his friend and countryman Julio Gonzalez. 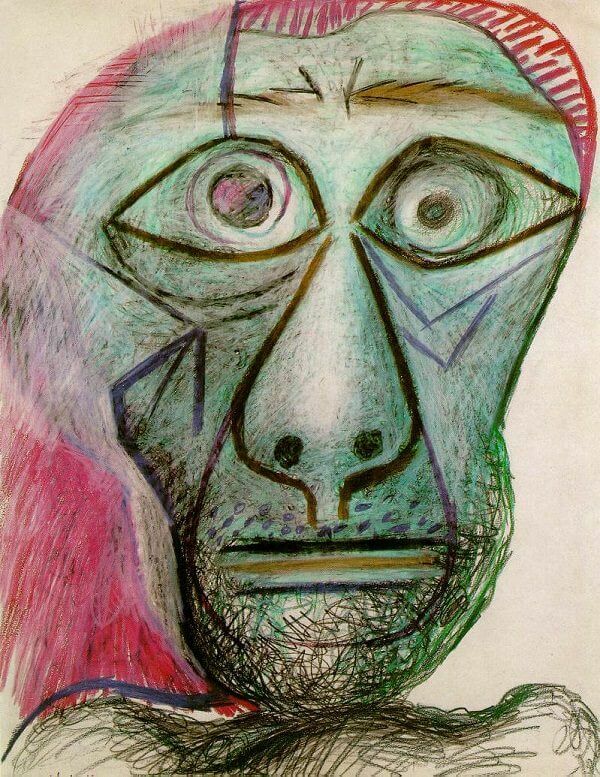 Now Picasso was preparing his own skull for such an event, and he stared with motionless intensity. This visage pauses at the frontier that separates life from death. Nothing else is expressed in the features, which in their rigidness reveal the extreme receptiveness of the eyes. And there is no doubt that these eyes are Picasso's. In other respects, too, the portrait stands at a crossroads. A few weeks earlier the painter had completed the series of 201 paintings that were to be his last "auvre." The isolation of the figures, which appear here and there in twos and threes, was his constant identifying characteristic. In broad and reckless strokes, Picasso had outlined these creatures and in each case he fitted them into a suitable format. The robust driving force of the painting style corresponds to the appearance of the archetypal figures depicted therein. The painter's head, too, is drawn in this spirit, which extends into the sphere of the graphic art that occupied Picasso in the ensuing months. He moved away from painting, moved in an opposite directions, toward the etching and engravings. The scenes become more and more lively and articulate. The clever distribution of brush stroke layers, in all shades between light and dark, consciously respond to the garish colors. A pandemonium of the senses emerges like a stage production, revealing the most diverse insights. 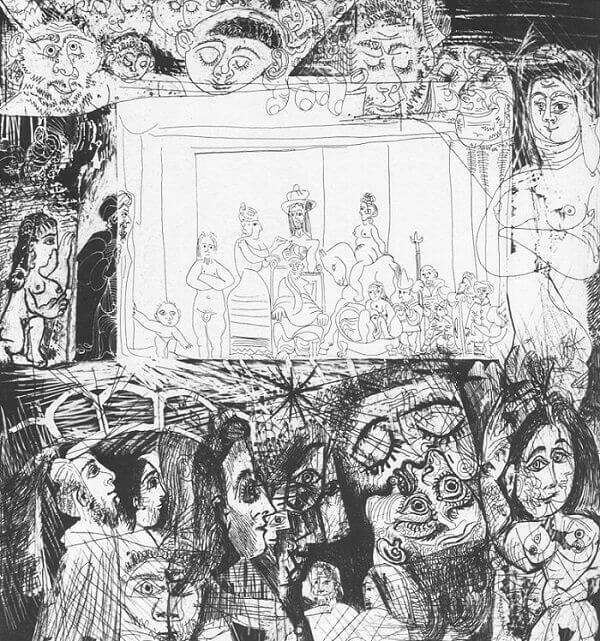 The cramped, often bizarre line, as well as the masquerade theme, is reminiscent of Ensor's vision of the Entrance of Christ. And, again, there is Goya, who by similar means in his later graphics interwove the banal with the metaphysical to an almost unbearable degree. This last tableau, something like a large and generally comprehensible vision. No descent into Hell or ascent into Heaven, but rather the closing image of an Oriental fairy tale: the family of man in clear light on an open stage. The feelings of perfection and yet familiarity it exudes are almost beyond comprehension. All around, in front of the forestage on Mount Olympus and among the scenery, the colorful bustle, and curious crowd, the inspiration abounds. No other representation in Picasso's later years has been able to unify the human condition of his art more freely and enthusiastically. The signature of our century could not have found a more appropriate repository than here. In the last years of his life, painting became an obsession with Picasso, and he would date each picture with absolute precision, thus creating a vast amount of similar paintings - as if attempting to crystallize individual moments of time, but knowing that, in the end, everything would be in vain. Pablo Picasso passed away at last on April 8, 1973, at the age of 92. He was buried on the grounds of his Chateau Vauvenargues.